If you’re ready to live fast and drive fast, then stop by Island Mazda near Brooklyn, NY to experience the 2017 Mazda MX-5 Miata. The MX-5’s iconic soft-top can be unlocked and dropped in one step and with one hand, right from the driver’s seat. Should the weather or your preference change, the “assist spring” mechanism make closing the top just as easy? When every part of a car works together seamlessly, performance and efficiency are maximized. That’s the simple notion behind SKYACTIV TECHNOLOGY. Body construction, chassis, transmission and engine work in perfect harmony to deliver thrilling performance without sacrificing efficiency. Fitting the headlights into the MX-5’s aggressively shaped body with its short overhangs meant reinventing the headlight. The position of each LED bulb, the parabolic-type LED high beam and the turn signal layout produce more intensity and better visibility for better driving. The MX-5’s 6-speed manual transmission is smaller and lighter than the previous generation’s but keeps its famed short-throw precision. Or choose the 6-speed automatic transmission with steering wheel-mounted paddle shifters. Highly rigid yet incredibly lightweight, the SKYACTIV-Chassis resists torsion during aggressive cornering and plays a key role in the MX-5’s celebrated nimbleness and stability. 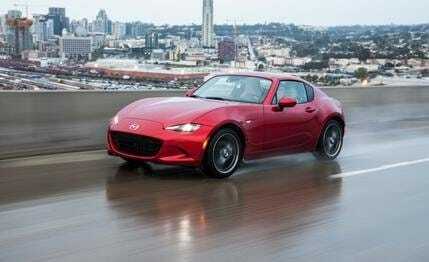 The original Miata changed the face of motoring by bringing pure joy back to driving. And over a million MX-5s later, that legacy lives on. We made the car. You made it the best-selling roadster of all time. Don’t hesitate any longer to test drive the 2017 Mazda MX-5 Miata at Island Mazda near Brooklyn, NY.